A cloudy day provided perfect conditions for FOBIF’s May walk on Sunday. 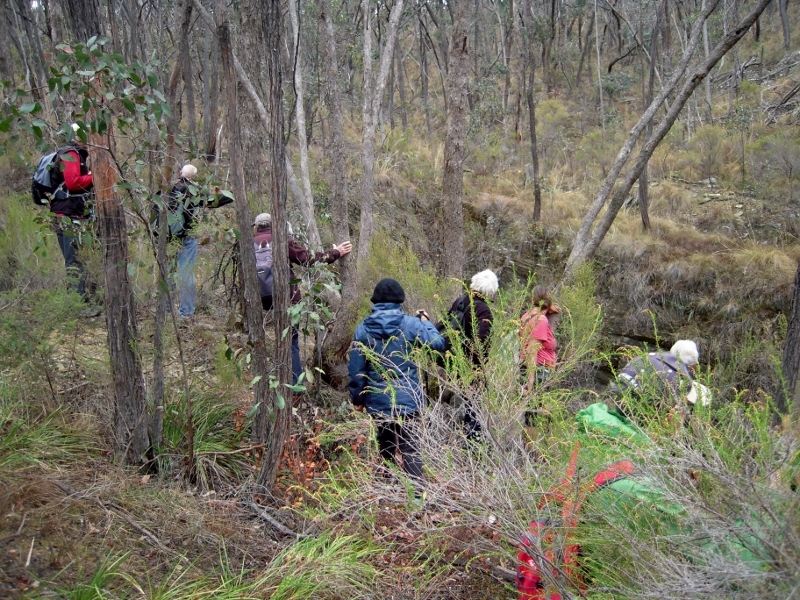 A group of 17 negotiated obscure tracks in the back country of the Poverty Gully race under the leadership of Richard Piesse and Elaine Bayes. The nooks and crannies of this area have many fascinations, cultural and natural, and there were frequent pauses to explore them. The tunnel of the Crocodile Reservoir water race in its deep cutting proved particularly interesting: fortunately none of those who peered over the edge needed to be rescued. What are they looking at? Walkers check out the northern entry to the Croc Res water race tunnel. Our thanks to Richard and Elaine for a stroll in air fresh enough to be invigorating without being uncomfortable! Next month’s walk will be led by Jeremy Holland into the Tarilta Valley. Check the program for details. If anybody wants to start up a commune – there is 62.7 acres for sale at present on the side of Mt. Franklin. Several good house sites. Jellis Craig (Castlemaine) has details.